No question, much of what is seen on episodes of HGTV’s House Hunters and House Hunters International is staged—fake-ish, a set-up. And honestly, I don’t care. The charming couple, or rambunctious family, or adventurous singleton, may have already selected their new address before ever contracting to be on the show and may be “re-staging” their search. Again, I don’t care. What I look forward to with every episode is a glimpse inside three residences from which the subject hunters ostensibly select the one that, like in the tale of Goldie Locks and her three bears, is “just right.” There’s something thrilling and highly entertaining about analyzing their choices and voyeuristically picturing myself in each of the properties; answering the same questions presented on the show; size, location, features, amenities, price. And finally, can I truly see myself living here? So far, I am fulling committed to moving to Sydney, Auckland, London, Paris (naturally), Salzburg, Raleigh, Washington DC, Denver, Palm Springs, and Key West. 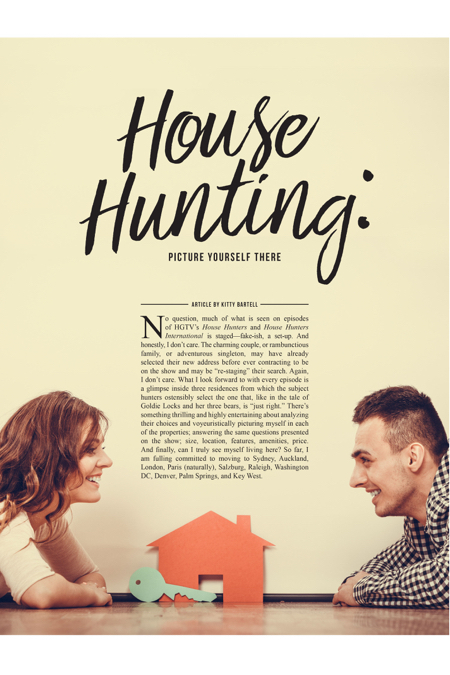 The successful formula HGTV has found with their House Hunters franchises boils down to the same pivotal question every property seeker must ultimately ask themselves; do I see myself living here? What it takes to answer that question are a multitude of features, amenities, and feelings to be evaluated throughout the process. If you have ever listened to a discussion about the location of a piece of real estate that is being considered for purchase, rent, or sale, how the property is described in terms of how far it is from something, or how close it is to something, will say a lot about its viability. “The house on Elm Street is 30 minutes from my job, but five minutes to the Piggly Wiggly.” “The walk to school is only two blocks, but we would be 15 miles from my parents.” These insights reveal a great deal about what’s important, and listening carefully helps determine if the location box may be ticked. Being able to string together a list of places and people the property is close to will likely indicate a good candidate. An equally long list of how far from specific places and people the real estate is may mean you will want to keep looking. The features of a home, whether an efficiency condominium or a multiple-acre estate, identify the practical aspects of a property, such as its location, the number of rooms and their uses, the square footage, or the amount of land included. Amenities, on the other hand, are also features of a property. However, they are considered less necessary to the function of the dwelling, and are inclined to provide comfort, convenience, or pleasure to the property owner or renter. A refrigerator may be a feature. That refrigerator may have amenities, such as French doors, an ice maker, Wi-Fi compatible video content monitoring, or accessible compartments for kid-friendly snacks. A home office may be simply an extra room or loft space. However, an office with built-in bookcases and high-tech wiring is amenity-rich. Features of the property are items expected to be included in the sale or rental. Amenities are the luxuries that create fluctuations in pricing. Awareness of the differences between features and amenities will assist in determining if the asking price is fair. Checking out the kitchen is usually the first stop for homebuyers, with bathrooms coming in a close second. These are the rooms that tend to have the most bells and whistles in a home, sporting the most fun features and amenities. How you see yourself using these spaces is the key to finding something that is “just right.” In the kitchen, gourmet cooks will have different requirements than microwave maestros. In the bathroom, are long, bubbly baths a requirement, or will any shower do? Being completely honest about what you need in these rooms will pay off, because renovations down the road are commonly costlier in kitchens and baths than anywhere else on the property. The face that any property presents to the world is made up of architecture: building architecture and landscape architecture. It may include amenities like manicured gardens and water and fire features, pools and spas, outdoor living areas, and cooking and play spaces. Most people know at first glance if the actual architecture of a home or building is to their liking, giving them the opportunity to offer a subjective yea or nay. Water features such as pools, fountains, and spas require care and attention. Plantings and lawns also require regular maintenance. Property hunters should take time to evaluate their level of commitment to the necessary exterior care, or consult with maintenance professionals to see just what they are getting themselves into. That being said, the exterior amenities of a property can be tons of fun. Swimming, barbecues, star-gazing, growing vegetables, cutting flowers, relaxing on a screened porch all are worthy of careful consideration. Number of bedrooms and baths are part of the floorplan of a property, along with the living spaces, kitchen and dining areas, work space, storage, which all create the home’s flow. Prospective buyers or renters should consider with care how the people in their household use their home. Is an open floorplan ideal, or do more cozy, secluded rooms make more sense? Where will the children drop their backpacks and jackets at the end of the school day? How much work and recreation gear does the family have—golf equipment to computers, surfboards to soccer balls, food processors to French presses? Lives will be lived here. Take the time to see how that feels before signing any contracts or making any offers.